Rose Bowl, Pasadena, CA. Attendance: 93,000. Northwestern's 1948 regular season record: 7-2 overall, 5-1 conference. NU finished second in the Big Ten (Big Nine). However, the conference's no-repeat rule (since scrapped) for the Rose Bowl kept Michigan home. NU's Coach: Bob Voigts. Captain: Alex Sarkisian. NU/California series record (prior to bowl): first game played against California. Scoring: NU: Aschenbrenner 73 yd run (Farrar kick); Cal: Jensen 67 yd run (Cullom kick); NU: Murakowski 1 yd run (Farrar kick failed); Cal: Swaner run (Cullom kick); NU: Tunnicliff 43 yd run (Farrar kick). HailToPurple posted this article proving that Murakowski's Rose Bowl TD was not a fumble in August 2013, just before Northwestern's rematch with Cal (which NU won, 44-30). Be sure to check out this 2008 Website feature from Northwestern Magazine, featuring an outstanding article by William Weinbaum that revisits the 1948 Wildcat team on the 60th anniversary of its '49 Rose Bowl win! The site includes great trivia, interviews, and rare film footage of NU's victory in Pasadena. 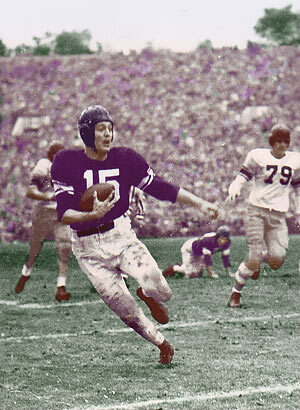 Ed Tunnicliff races to the winning touchdown in the 1949 Rose Bowl. touchdown run, finished the day with 119 yards rushing. Tom Worthington snags one of two interceptions for NU. The Wildcats came into the 1949 Rose Bowl as underdogs. California had taken a blow torch to its opponents in 1948. Its vicious ground attack averaged 28 points per game, and its line was talented and deep. Northwestern had little depth, but its starters (nearly all of whom had been recruited by Cal coach Pappy Waldorf, when Waldorf was NU's coach) were resourceful and experienced. The Pacific Coast Conference wasn’t exactly impressed that its co-champ, likely on its way to a national crown, was going to face the Big Ten runner-up. Voigts made sure his players saw all of the newspaper articles that dressed down Northwestern. After the pre-game ceremonies and festivities over 92,000 fans watched Wildcat George Maddock kick off to California under a gloomy, overcast sky. Jack Swaner returned the ball from the Bears’ end zone out to the 21-yard line. Cal and NU traded three down-and-out drives and punts, and Cal returned Northwestern’s punt to the Bear 21, right where it had started its previous drive. On third down and five, Jackie Jensen took the ball, swept right, and fired a pass. Junior Loran “Pee Wee” Day, the Wildcat halfback and safety, intercepted Jensen’s throw at the Northwestern 25-yard line, sending the Rose Bowl crowd to their feet. On the very next play Northwestern’s rushing leader, Frank Aschenbrenner, ran 16 yards and then fumbled, giving the ball right back to California, on the Northwestern 41-yard line. However, the ‘Cat defense stepped up and stymied the high-powered Bear attack. Cal ran for a two yard loss, threw an incomplete pass, and was then dropped for another loss, taking them out of field goal range. The ensuing Cal punt gave Northwestern the ball on its own 27-yard line. The Wildcats gave the ball again to Aschenbrenner. This time he held onto it, and sprinted 73 yards for a touchdown. Jim Farrar made the extra point, and Northwestern had stunned the Bears, scoring first. On the next play from scrimmage Jackie Jensen responded for Cal, running 67 yards virtually untouched and tying the game less than a minute after NU had scored. . . When the Bears’ first series in the second quarter failed, Jackie Jensen punted to Johnny Miller. Miller began to return Cal’s punt, then handed the ball to Worthington, who raced to the Cal 22. Rushes by Murakowski and Miller advanced the ball to the California one-yard line. On first and goal Murakowski took the ball and lunged for the end zone. Just as he crossed the goal, however Murakowski lost the ball, which fell into the end zone and was recovered by Will Lotter for the Bears. 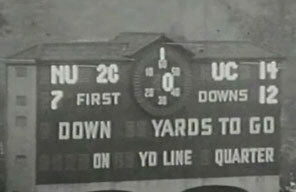 Murakowski was ruled to have successfully crossed the plane before losing the ball, and Northwestern took a 13 to seven lead. . . For the rest of the second quarter neither team had another clear opportunity to score. . . The third quarter started as a defensive battle between Northwestern and California, but midway through the period NU quarterback Don Burson fumbled. Cal recovered at midfield and began an eleven-play drive that culminated with Jack Swaner punching in the touchdown. When Jim Cullom’s PAT sailed through the uprights, California took the lead for the first time. With Cal leading by one point in the fourth quarter, the teams again traded punts, and NU’s offense appeared to have stalled. The Wildcats faced second down and long from their own 12-yard line, and less than five minutes left in the game. Aschenbrenner took the snap and swept right, then fired off Northwestern’s only completed pass of the game, a 17-yarder to Don Stonestifer. Aschenbrenner and Gasper Perricone took turns running the ball, bringing the ‘Cats to the Cal 43-yard line. On second down center Alex Sarkisian, rather than snapping the ball to quarterback Don Burson, snapped it directly to halfback Ed Tunnicliff. Burson faked a pass to Aschenbrenner, and Tunnicliff slashed his way though the perplexed Bear defense and streaked to the endzone, aided near the goal with some key blocking by sophomore Richard Anderson. The trick play sent the Wildcat fans into a frenzy. Jim Farrar made the extra point, and the Wildcats went on to upset California, 20 to 13. . . Most fans and alumni at the time considered the Rose Bowl win to be the greatest moment ever in Northwestern sports. It eventually provided the climax to a period in the program’s history that, while lacking conference championships, gave the school its greatest stars, a string of All-Americans, consistent top-ten rankings, and national respect.